Bus service in New York is getting worse and losing riders, and unless policy makers step in and make systemwide improvements, those trends may accelerate in a vicious cycle. New York can turn things around, advocates say, with a suite of policies to get buses moving quickly and reliably again. Today a coalition of transit advocates unveiled their blueprint to fix the city’s surface transit system and win riders back over. The solutions they propose in “Turnaround: Fixing New York City’s Buses,” a new report from TransitCenter, are broad and thorough but eminently achievable — rethinking the bus network, modernizing fare technology and dispatching, and expanding street design features that have already sped service on a handful of routes to improve routes all over the city. The poor state of bus service in New York amounts to a crisis, said Riders Alliance Executive Director John Raskin. With an average weekday speed of 7.4 mph, New York’s buses are among the slowest in the nation, and they’re getting slower. Making matters worse is the lack of reliability — traffic congestion, lengthy routes, and shoddy dispatching often cause long gaps in service as buses bunch up in clusters of two or more vehicles. 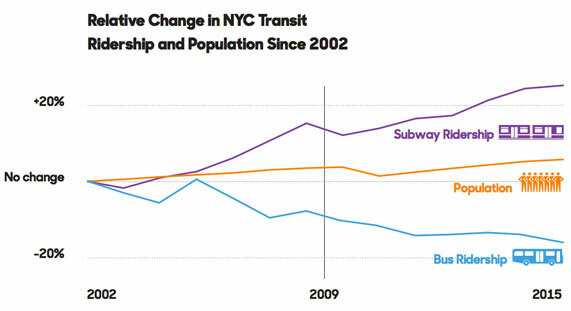 It’s no wonder that bus ridership in New York has steadily declined even as population and jobs have increased. Implementing “tap and go” fare collection and all-door boarding. Utilizing real-time GPS data to improve dispatching, so buses stay on schedule and don’t bunch. Taking Select Bus Service features like camera-enforced bus lanes, priority for buses at traffic signals, and “queue jumps” for buses to get a head start at intersections — and applying them citywide. Updating the routes in a bus network that has barely changed since the streetcar era. Publishing bus data in an open format so the public can assess performance and hold agencies accountable. While Governor Andrew Cuomo has celebrated the addition of on-board WiFi and USB outlets this year, Raskin said such improvements are “a valuable but insufficient step.” Instead of bells and whistles, the report recommends technological advancements that will make a real impact on service. To bring bus dispatching into the 21st century, for instance, the system should not just respond to breakdowns and emergencies, but proactively maintain the scheduled distances between buses by using GPS information to inform bus drivers when they should make adjustments. Millions of New Yorkers ride buses, Raskin said, but elected officials don’t treat bus service as a high priority. The campaign, which includes the Riders Alliance, NYPIRG’s Straphangers Campaign, Tri-State Transportation Campaign, and TransitCenter, got off to a good start with today’s rally in downtown Brooklyn, where bus speeds are among the slowest in the city. In addition to Adams, City Council Transportation Chair Ydanis Rodriguez, Public Advocate Letitia James, State Senator Daniel Squadron, Assembly Member David Weprin, Brooklyn Deputy Borough President Diana Reyna, and Council Members Ben Kallos and Vincent Gentile attended the rally. TWU Local 100 did not send reps, but expressed support for the campaign in a statement. 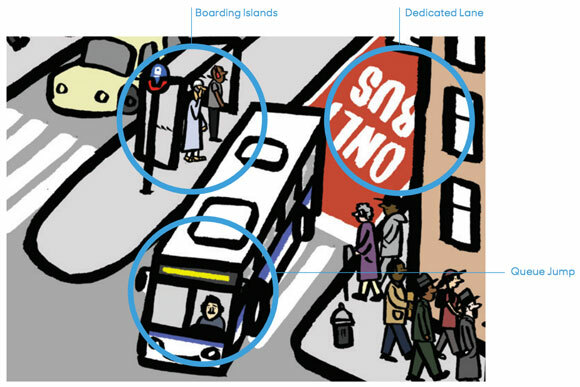 Let’s really think big: A car-free Island of Manhattan will unclog bus service and eliminate congestion there. And enable pedestrians and cyclists (in other words, everyone) to get where they are going easily and conveniently. dedicated bus lane 7am – 7pm should be default setting on every single major street in all 5 Boros. Walking past the Rogers ave SBS B44 lane at about 7:01 the other day, and seeing how it instantly filled with cars and that the buses were slowed considerably, made it clear that 7pm is too early a cut off. This is NY. Rush hour goes to about 8 or 9. Hell, Sat. nights in Manhattan can be a nightmare, too. Physically separated bus lanes, off board payment, traffic light priority. We need to step away from the commuter mentality when thinking mass transportation. A lot of people depend on buses at all hours of the day. They shouldn’t be forgotten. If buses ran faster and more frequently at off peak hours, they could absorb a lot of trips. Well, not pennies, but yes, relatively cheap, and definitely not 36mos. Keep in mind that every single street that is altered (yes, this includes paint) must be signed off on by engineers (and many times NYFD, NYPD, DEP, and CBs). I’m not necessarily saying this system makes the most sense (especially the timeline), but it is how things currently operate, so this must be factored in. Perhaps the total population isn’t what’s relevant for buses. It is the population that would never, ever take the subway, and is over 50. That population has been dying out and bus ridership with it. I tried to take a bus from 70th and York at 9 pm not too long ago. It was a nightmare — I could have walked, and ended up just walking to the Lex. There will be a subway nearby soon. unfortunately that is too big a leap for the incrementalist approach that seems to be only way things change in NYC. Hey, if you can get 24/7, physically separated bus routes put in place, be my guest! But the fact is, service can be expanded off-hours without necessarily implementing 24/7 bus lanes, because there isn’t congested traffic blocking the buses at midnight. NYC Taxi & Limousine Commission would successfully lobby against this. Bus lanes may not be needed after, say, 9 or 10 PM but traffic signal preemption is needed 24/7. Or better yet, NYC could do what virtually every other place does and have the signals go to flashing yellow on the arteries late nights, flashing red on the cross streets. Everyone benefits from that, not just buses. I think that’s the problem. We’ll get more bang for the buck focusing on improving bus lines with a captive audience, like those in the outer boroughs. The ridership for buses in areas with good subway service is niche at best, mainly people who have problems with stairs. All good ideas. I’m was saying the lanes ARE needed later than 7. At least on the B44. 9pm would do. I live in an area with good subway service (for the moment), but sometimes use buses for some reasons. But they are excruciatingly slow, and increasingly infrequent. So the rest of the family is shifting to Uber, Lyft, car service, and paying up for it for non-subway trips. We’re already considering a world where things operate differently lol, as DOT doesn’t operate this way either. The point is there is no engineering, financial, or technical reason that cannot happen, simply bureaucratic and political reasons, and those frustrate people because they largely see them as unnecessary, and they are partially correct. If bus lanes become normal lanes when the road isn’t congested, what is the point? The extra lanes aren’t needed then for cars, all you do is speed up cars, and slow down buses. If you’re willing to have congestion hour bus lanes (as opposed to “commute hour”), then should just be 24/7 lanes. Hang on, is it the red zone or the white zone that’s for loading and unloading only? Come ride the Bx12 SBS and tell me that bus ridership is declining. It’s a rush hour 6 train on rubber tires 12-14 hours a day. The local buses really are terrible, though. I think half the reason why the bus system is so poor is because it’s viewed by some in the political class as a system of last resort (for the poor/elderly/disabled) that only exists to meet ADA mandates. All streets that have bus routes should be closed to cars. It’s not rocket science. Only on SBS has ridership been increasing. But ridership citywide has been decreasing. Therefore, if SBS can show us anything, it’s that these recommendations are exactly what’s needed citywide. Update from this morning. SBS is 10 minutes late arriving to West 207th. Crush conditions. Crawls down Fordham Road in traffic at 8am. Multiple bus lane violations. I timed 25 minutes from West 207th to Fordham Metro North. This is a distance of 2.0 miles. I would just ride this route on my bike but Fordham looks and feels kind of suicidal on a bike, like a Bronx version of Flatbush Avenue in Brooklyn. Hmm in that case, why wouldn’t NYC Taxi & Limousine Commission be totally *for* this, because you’ll have to take a cab if you don’t allow private cars? Except there are too many cars in Manhattan now. Only thing you can probably do is to close tunnels and bridges coming in in the mornings. Or, support congesting pricing with Move NY. A Manhattan congestion charge would achieve much of this. Good luck getting Albany to sign up though. Will the MTA Deliver Bus Service That People Want to Use?